WWF Nepal will carry out conservation education programs all across the country but with a focus and emphasis in the priority project areas. WWF Nepal integrates education in its programs and projects to make people from all walks of life aware of the issues of conservation, thereby bringing positive attitudinal and behavioral changes. It does this with the help of Eco Clubs, network organizations, scholarship programs and campaigns. 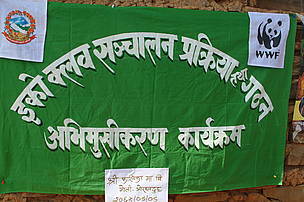 WWF Nepal is now set to expand and strengthen networks, such as Eco Clubs, and its scholarship programs. WWF will also provide platforms for a wider range of people to learn and appreciate the environment and to acknowledge the link between conservation and sustainable development. In the next five years, WWF Nepal will also organize an ambitious youth campaign titled “The Generation Green” to engage youth in conservation. Internships within WWF Nepal will also be established to allow young individuals to learn from WWF and use such learning in their future career and lives. GOAL: To create awareness and inform people from all generations and from all walks of life on the issues of conservation and sustainable development. A member of the Eco Club during the Eco Club day. Members of the eco club in Chitwan.